The real appeal of Panini America’s Immaculate Baseball brand has always been its ability to bewilder with a virtually unparalleled selection of unique memorabilia cards featuring, among other things, jerseys, batting gloves, fielding gloves, cleats, hats, socks, jackets, wristbands and more. Sure, the autograph checklist always stands out and the aesthetics pop, too. But it’s the uniqueness and variety of the memorabilia cards that give Immaculate Baseball its edge. And so it shall be once again on August 1st when 2018 Immaculate Baseball arrives at Sports Cards Plus inside six-card hobby boxes that deliver five autograph or memorabilia cards and one base card or parallel. The product features an impressive array of on-card autographs and a checklist packed with the game’s hottest current stars, greatest legends and promise-packed newcomers. 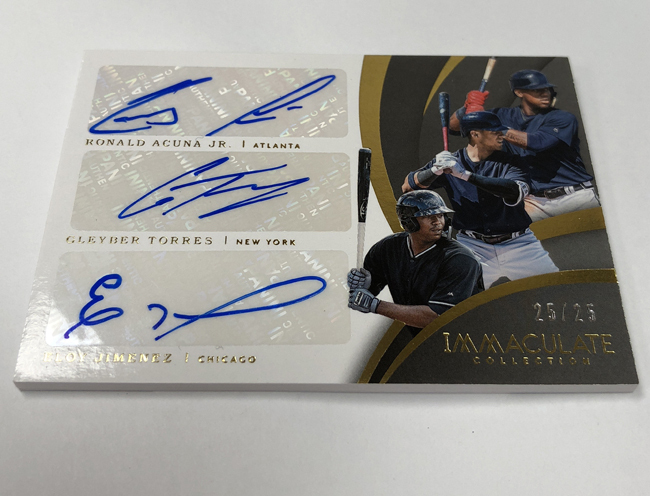 The highlights of 2018 Immaculate Baseball are many and include . . . Rookie Patch Autographs feature on-card signatures and prime memorabilia pieces with three parallel levels numbered to 49 or less. Also find Rookie Patch Autographs Dual Materials and Quad Materials chases. The most sought-after memorabilia cards of the 2018 rookie class, veterans and retired players in Immaculate Jumbo Materials. On-card dual autographs featuring teammates, rookie classmates and additional pairings. With a mix of current, veteran and legendary players, Shadow Box Materials combines a unique checklist with two swatches of memorabilia. Unique autograph cards with signatures on parchment, tweed weave, bats, carbon stickers and more. The 25-card Immaculate Signatures delivers autographs from fan favorites of the last several decades. The 35-card Immaculate Legends pays memorabilia tribute to the greatest legends of all time. Look for two parallels numbered to 10 or less.